Celebrating over 132 years of winemaking history, we are thrilled to offer this one-of-a-kind wine from the historical VanZ vineyard. Located northeast and a stone's throw from downtown St. Helena, this mature Cabernet Sauvignon vineyard is dry farmed, producing low yields and very concentrated fruit. Warm and very well-drained soil, this vineyard ripens relatively early, producing tiny berries that impart rich, dark fruit flavors, coupled with very dark color. This vineyard is the backbone of our special bottling called Josephine, a tribute to the women who started our winery in 1886. After graduating from college, I wanted to make Cabernet Sauvignon. 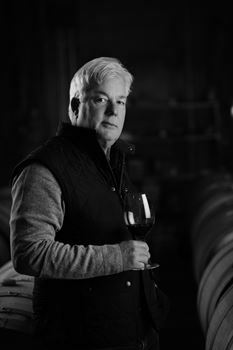 I took a position with Freemark Abbey Winery in 1980 as the assistant winemaker; I couldn't have landed in a better spot to learn my craft. After two vintages, I was transfered by the mutual ownership to Rutherford Hill Winery to be the associate winemaker. In 1985, the partners invited me back to become the winemaker at Freemark Abbey Winery. I have been in charge of the Freemark Abbey wines from that point to present. I like comparing winemaking to cooking. Just as a chef would grow his own herb and vegetable garden, it is ideal for a winemaker to actively participate in the vineyard, see the grape growing through harvest, and bring this abundantly juicy produce to the winery, our kitchen, to make a full-bodied wine with layers of flavor. To develop the flavors that we want, it is important to use the right varietal, rootstock, and selected clone for the soil. Then the appropriate trellis system with shoot positioning must be used to maximize the most desirable effects of the sun, turning that precious sunlight into wine.